Experts around the country have released their predictions for the 2015 hurricane season, which runs from June 1 through November 30. The U.S. Climate Prediction Center, a part of the National Oceanographic and Atmospheric Administration (NOAA), predicts a 70 percent likelihood of six to eleven named storms, including up to two major hurricanes. While the chances are good for a below normal season, home and business owners alike would be wise to take necessary precautions and not rest on false security. It doesn’t matter how many storms there are in any given season since one major weather event alone can cause devastating damage. Even in a quiet season, there’s no telling where a storm could land. Experts suggest that climate change is impacting hurricanes in two significant ways. First, with sea levels rising and the levels of rain during a hurricane increasing, storm surges are becoming a bigger threat. 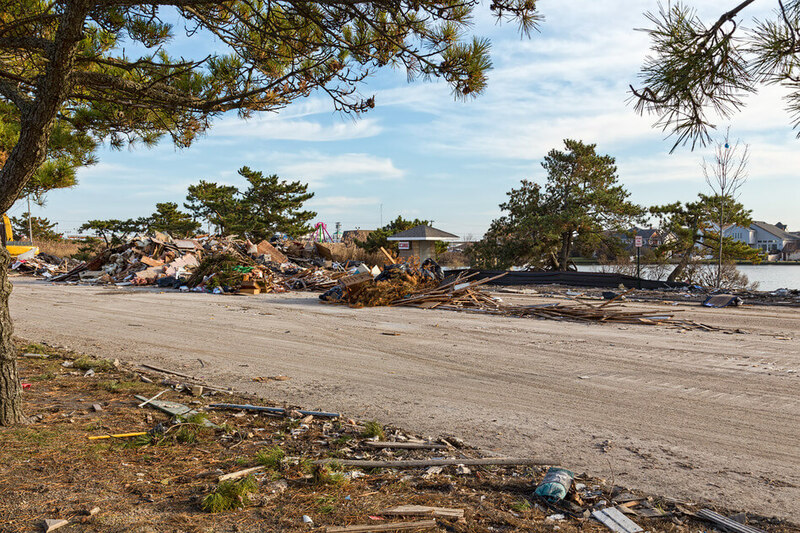 According to a report from CoreLogic, there are more than 3.8 million homes along the Atlantic Coast at risk of storm surge, and the Gulf Coast has nearly 2.8 million. In fact, in addition to hurricane and tropical storm warnings and watches, which primarily focus on a storm system’s wind, those living along the coast will begin to receive alerts from the National Hurricane Center in Miami when water might rise 3 feet above normal. Second, hurricanes appear to be gathering strength farther north, with potential landfall in the Mid-Atlantic region to New York and Massachusetts increasingly likely. Areas previously thought to be less susceptible to hurricanes are now predicted to see more weather activity. Inspect your house and repair anything that could lead to water leakage including your roof, windows, skylights and doors. Don’t forget your garage! Replace windows with impact-resistant systems to avoid breakage by flying debris. Storm shutters can also help protect windows during a storm. Install a back-up generator, preferably one that can power air conditioning throughout the home which can help aid drying out the house in case water should get in. Generators should also be strong enough to supply power to crucial electrical appliances and electronics, including your alarm system. Inspect the trees around your home for weak limbs and overhangs. Prune or remove branches as necessary. Consider downloading apps to your phone that can aid in a disaster situation. Some options are NOAA Now, Red Cross First Aid, and FEMA. Create a disaster preparation plan for your collections and valuables. Make an emergency plan for your family. Ready.gov is an excellent resource to help you build this plan and communicate it with everyone, even children. Your plan should include contact information, meeting locations in case of evacuation, and a basic emergency supply kit including food, medication and hygiene items for all family members and pets. Install storm shutters and secure your garage door. Remove outdoor furniture and other items such as potted plants and lawn ornaments to prevent damage from flying objects. Store these items indoors. Be sure your cars and generator have sufficient fuel. Check generators to be sure they are working properly. Gather documents including insurance policies, bank and credit card information and important contact numbers, as well as items that may be needed during an evacuation. Store these items in a plastic container that will be easily accessible if you must leave your home quickly and will be protected from the elements. Remove or elevate items near windows and doors, or in lower parts of the home. Secure your collections and valuables. Verify contact information for employees and vendors. Knowing how to reach your employees, both to check on them as well as to keep them up-to-date on the business, is critical. Be sure to gather important information for suppliers, vendors, banks and insurance carriers. Identify critical business functions. Know how long your business can tolerate being down, what must be done to meet legal or regulatory obligations, and what functions are essential to keep your business alive and well-regarded. Be sure employees are aware of their roles and responsibilities during this time. Prepare an alternate site for business operations. If necessary, plan ahead for a recovery location the business can operate out of while the original business location cannot be used. Check in with the location provider to review plans and needs in case of an event. For additional tips on disaster planning for businesses, visit the Insurance Institute for Business & Home Safety’s website. According to a survey by Bankrate, one in five homeowners do not know that a homeowners policy specifically excludes flooding. In addition, a standard commercial policy, including a Commercial Package Policy (CPP) or a Business Owners Policy (BOP), will not cover flooding to a commercial property. Flood insurance for both homeowners and business owners must be obtained through the federal government’s National Flood Insurance Program (NFIP). On both the personal and business side, take the time to review your coverages prior to a loss to avoid confusion later. Schedule a time to talk to your insurance professional and understand your policies. Preparing your home and business for severe weather doesn’t eliminate the risk, but it can go a long way toward minimizing loss and can provide peace of mind that you’re as ready as you can be.